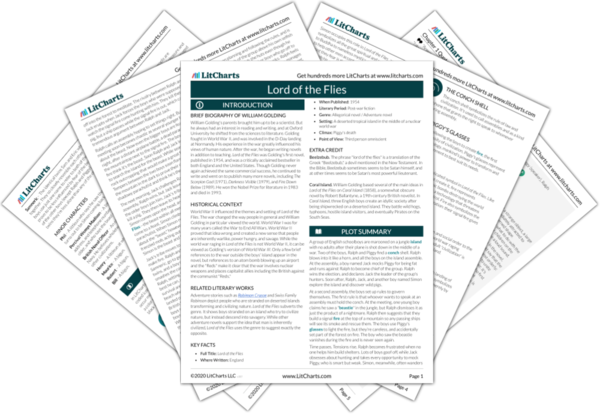 Instant downloads of all 942 LitChart PDFs (including Lord of the Flies). 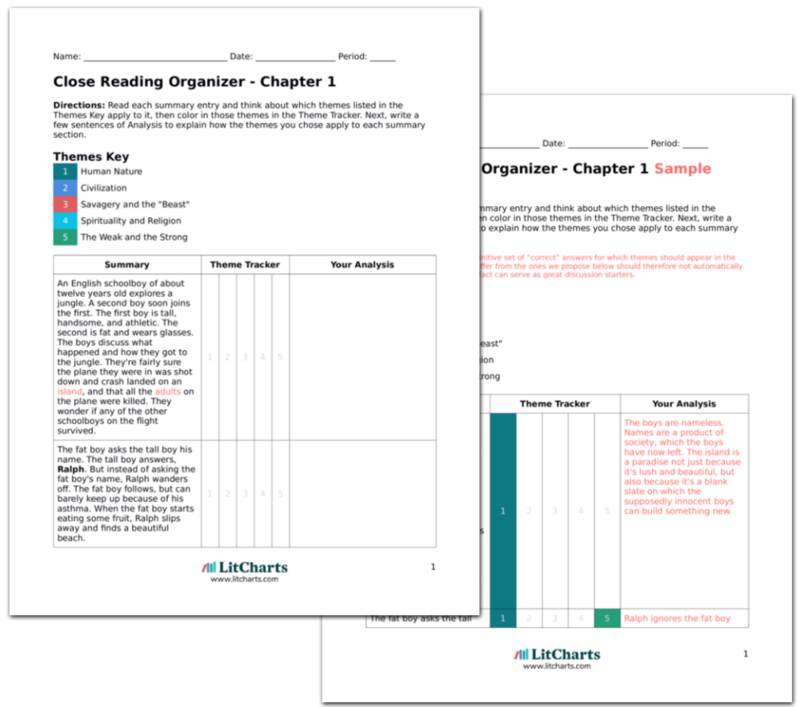 LitCharts assigns a color and icon to each theme in Lord of the Flies, which you can use to track the themes throughout the work. An English schoolboy of about twelve years old explores a jungle. A second boy soon joins the first. The first boy is tall, handsome, and athletic. The second is fat and wears glasses. The boys discuss what happened and how they got to the jungle. They're fairly sure the plane they were in was shot down and crash landed on an island, and that all the adults on the plane were killed. They wonder if any of the other schoolboys on the flight survived. The boys are nameless. Names are a product of society, which the boys have now left. The island is a paradise not just because it's lush and beautiful, but also because it's a blank slate on which the supposedly innocent boys can build something new. The fat boy asks the tall boy his name. The tall boy answers, Ralph. But instead of asking the fat boy's name, Ralph wanders off. The fat boy follows, but can barely keep up because of his asthma. When the fat boy starts eating some fruit, Ralph slips away and finds a beautiful beach. Ralph ignores the fat boy because the boy is fat and weak. Even in paradise, human nature is prejudiced against weakness. Eventually the fat boy finds Ralph and proposes they call a meeting and make a list of everyone who survived. He lets slip that in school people called him Piggy. Ralph laughs. Piggy begs Ralph not to tell anyone. Piggy, the weak boy, tries to win the friendship of Ralph, the strong boy. Piggy's desperation only makes him seem more weak. The boys keep exploring. Ralph finds a perfect swimming hole and says his father, who's in the Navy, will come rescue them. But Piggy is fairly certain that no one knows where they landed. Piggy says they have to do something. Just then, Ralph spots a huge conch shell. Piggy realizes they can use it as a trumpet. Piggy can't blow it himself, because of his asthma, but shows Ralph how to do it. Ralph blows, and a huge blast sounds. Though weak, Piggy is smarter than Ralph. He comes up with the idea for the meeting and using the conch. By blowing the conch, Ralph and Piggy both become civilizing forces: they organize the boys to figure out what to do. 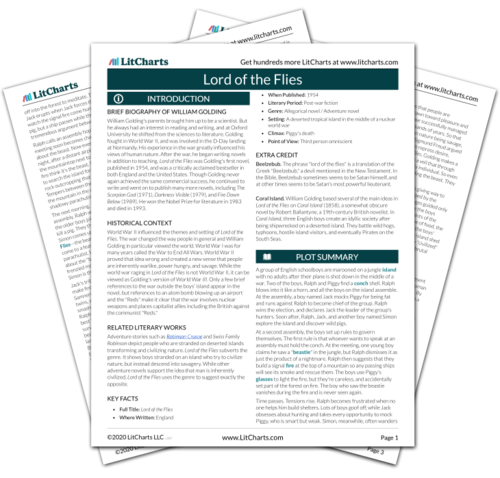 Get the entire Lord of the Flies LitChart as a printable PDF. All the boys gather on the beach: they range in age from six to twelve. There's one set of twins, Sam and Eric. A group of the older boys are members of a choir, dressed in black. Their leader is Jack, a redhead who tries to take control of the meeting. One of the boys in the choir, Simon, faints. Jack soon tells Piggy to shut up, and calls him "Fatty." Ralph gleefully reveals that Piggy's name is "Piggy." Everyone laughs, humiliating Piggy. The meeting is Piggy's effort to build a "civilization," but already Jack seeks to take over by mocking Piggy. Ralph plays along, wanting to seem strong. Fainting spells like Simon's were once considered signs of a spiritual connection to higher powers. The boys decide to vote for a leader. Everyone in the choir votes for Jack, but all the other boys vote for Ralph because he blew the conch. To keep Jack happy, Ralph says that the choir will be hunters and Jack will lead them. As the conch-blower, Ralph symbolizes civilization. But Ralph realizes he must keep Jack happy: civilization makes a deal with savagery. Ralph decides the boys must explore their island. He and Jack will both go, of course. Ralph ignores Piggy's whining pleas to be included, and picks Simon to be the third explorer. Ralph, Jack, and Simon have a great time exploring, and stop to push a huge boulder off a cliff, which seems to them like a great accomplishment. The three boys who symbolize civilization, savagery, and spirituality all go to explore the island together. As of now, all three are united. The boys climb to the highest peak on the island, which they call the mountain, from where they can see that they're on an uninhabited island. They also see the "scar" where the crashing plane tore through the jungle. Ralph says of the island, "This belongs to us." Ralph claims the island for civilization. But in doing so he also claims the scar, the symbol of the savagery that exists in human nature. Soon the boys head back down the mountain to the beach. On the way, they spot a wild pig caught in vines. Jack pulls out his pocket knife, but pauses before striking, and the pig escapes. Jack vows not to hesitate next time. Jack's still too "civilized" to kill the pig. But the sight of the pig sparks his savage desire to dominate anything that lives. Florman, Ben. "Lord of the Flies Chapter 1." LitCharts. LitCharts LLC, 22 Jul 2013. Web. 20 Nov 2018. Florman, Ben. "Lord of the Flies Chapter 1." LitCharts LLC, July 22, 2013. Retrieved November 20, 2018. https://www.litcharts.com/lit/lord-of-the-flies/chapter-1.